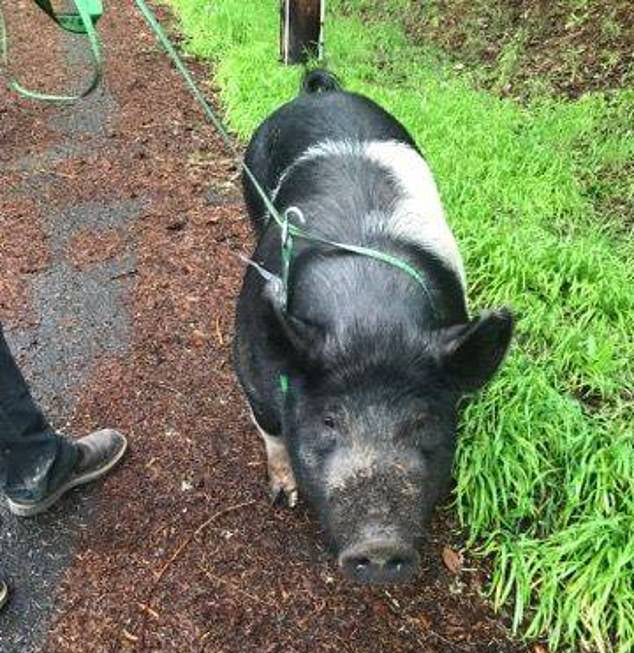 Someone in California took the above oft-used phrase in the presence of babies a little too literally, after getting gooey eyes and a rumbling stomach for an escaped pet pig in Arcata, California. No more jokes, promise. I got you, Babe. 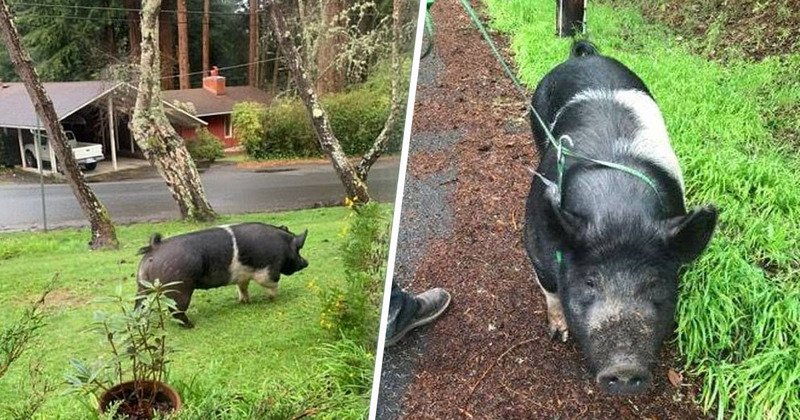 Last Saturday morning (March 23), Princess, a near-400 pound Hampshire cross, escaped her pen and took a morning stroll around her neighbourhood, Lost Coast Outpost reports. 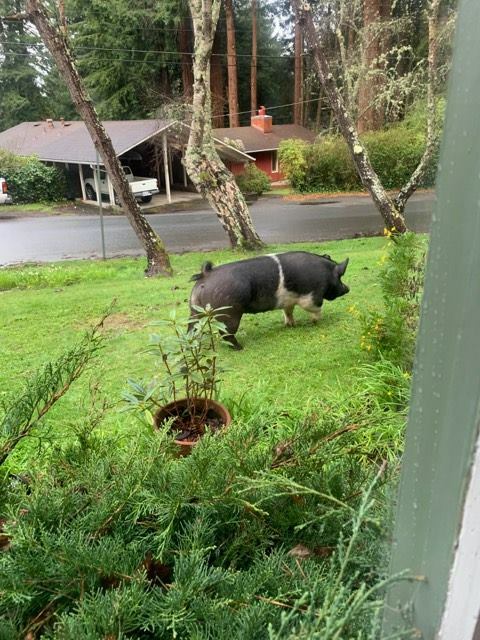 Princess quickly drew the attention of concerned neighbours whose gardens she was stopping by to graze on for breakfast, and quickly appeared on Humboldt Paws Cause’s Facebook page. The cops were brought in to figure out what to do while the porcine Houdini’s owners were located. She had no markings and wasn’t carrying any ID. No one knew anything about the pig in the city, so it’s understood the police agreed with the man who was monitoring the scene, he’d look after it until a solution was found. Within a few hours it became apparent Princess was taken to a nearby property where she was slaughtered and carved up for meat. We were totally shocked and surprised to learn that the pig had been slaughtered. There was no reason to believe that that individual was going to do that. She and her family had raised Princess since she was a piglet, at times bottle feeding her at home. Hogan’s daughter, a member of the FFA (Future Farmers of America), had shown Princess at a fair last year. Princess was, simply, part of the family. Princess had been living in a pen at Hogan’s mum’s place when she escaped. Hogan said while she’s a supporter of law enforcement she’s upset with how the officer handled the situation. He took it upon himself to give my animal away and then it got butchered. Hogan’s mum was the first family member to hear the horrid news. In another gruesome twist, as she made her way to the property to confront the man who’d killed Princess, she found the man still cutting her up. When she confronted the man he was dismissive and told her to leave. As far as Hogan is aware, Princess’ killer still has possession of her. She wants to retrieve Princess’ body not to deprive people from eating her but to seek legal justice for their beloved animal. I think that the hardest part of this is knowing there’s somebody out there that’s this kind of a savage. Chief Ahern is hopeful Princess’ killer will face the full brunt of the law and has passed the case on to the local district attorney. ‘We are evaluating whether there was a crime. We believe there was,’ he said.